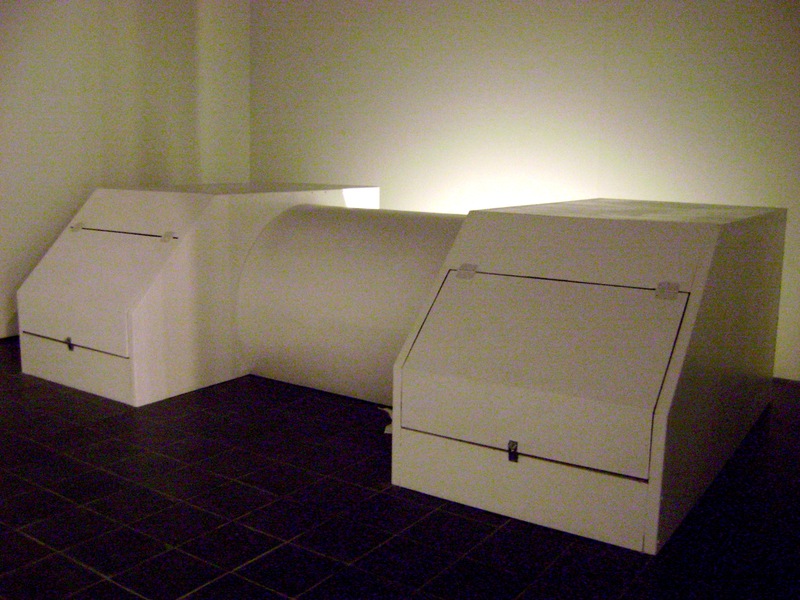 The visual deprivation tanks are installed. They are still a work in progress, a baby requires constant care! I have installed a handle and hook inside the tanks so that participants can shut themselves in without an attendant there to lock them in. This will change the entire way people interact with the piece. Having an attendant there is anxiety inducing because people might feel odd with someone hovering. If people have the freedom to come and go they will linger more with the piece which is the goal. On opening night of our MFA thesis exhibition Ian (assistant) was a space druid usher, letting people into the tanks. “Would you like some booties?” A genius opening line to make people comfortable in the shadow of this intimidating art beast. Since I wanted that night to be a spectacle it made sense. There was a long line of people who increased my confidence. Some people came out of the tanks wanting to meditate longer; others were disturbed by it. Success! Sometimes when I talk with faculty I don’t think they don’t get what I’m doing or even like it very much. Any bit of positive feedback helps. This is a one minute clip of the sound design. The birds-eye view of the tanks reveal a setup reminiscent of the human head (left ear/head/right ear). The soundtrack is stereo with ‘euphoria’ on the left and ‘dysphoria’ on the right. The center of the tunnel is the crossfade. This clip simulates moving from left to right in the tanks. Using these extremes of sound 1) makes for an engaging soundtrack, 2) references the range of human states of mind, and 3) points to the extreme uses of sensory deprivation (historically, for torture and therapy). I created visualization cards. 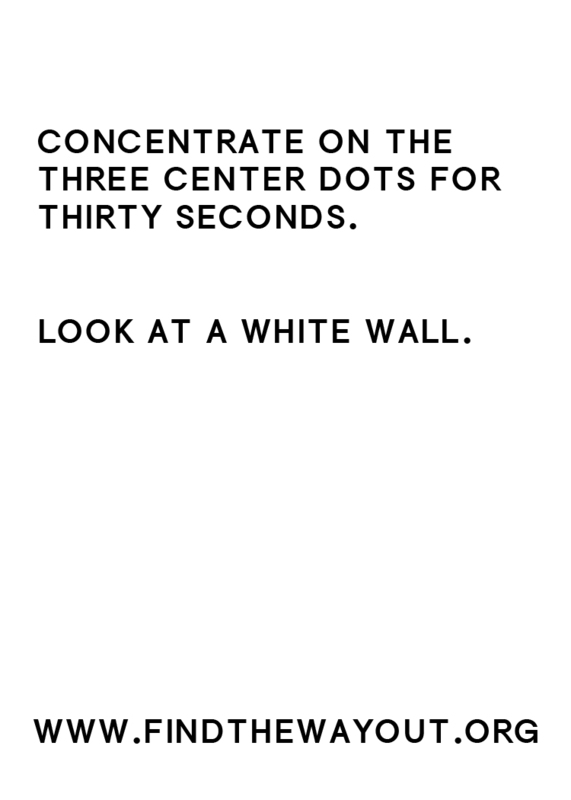 Take a look above and try it out! These are inspired by religious ephemera that you find in small town diners and snuck in library books. Usually you see Jesus. I need feedback on The Way Out community. Does it need a god-like thing to worship, a ‘face’ to the void representing the stuff of the universe? I was thinking of creating something called Space Face, the energy in everything. What do you think? My thesis paper will be the beginnings of a collage style book I am writing called The Way Out: Tenants, Rites, and Rituals. I will focus on the tenants of The Way Out community in this paper. Here is an idea of what I will do but it’s rough at this point. That should be telling that I haven’t started my paper. I will use the framework of new religious movements (Scientology, Mormonism, etc.) but with theories and ideas I believe in. I like the confusion of using their methods and critiquing them simultaneously. Through their methods I gain a respect for them, for their ability to tap into peoples’ psychological needs, even though some have done awful things. Here’s my artist statement as a reminder of where I am coming from. The problem isn’t you, it’s Earth. The Way Out is a community we’ve established on the moon in response to our planet’s terminal illness. Earth is a lost cause and living on it leads to permanent brain damage. The Way Out awakens our senses and deprograms Homo sapiens of neurotic behaviors, freeing us. Our greatest lunar development: specialized deprivation tanks. The sounds emitted in the chambers allow you to reconnect with your body’s primordial reptilian instincts. This is an invitation.